Grab your chance to be a hero! Love computer games or Decide Your Destiny books? Show off your hero skills in four storming interactive quests. YOU are a ninja, a spy, a superhero or a warrior princess. You are on a dangerous mission. Your choices will decide the outcome… Think games in book form: thrilling action fantasies where you choose the moves that matter. 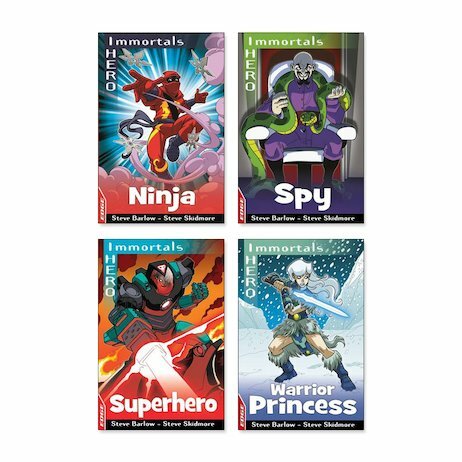 All in a fun easy-read format from a series that helps to boost reading skills. Show that you’ve got the drive to survive. Steve Barlow and Steve Skidmore are widely known as a very successful double act and have written a number of books for children. Their trademark silliness and anarchic behaviour has made both them and their titles favourites with the 8-12 readership.